Well, hello there! My name is Alex Bradley, what's yours? Don't answer here, there's a much better place to tell me on this page, I'm 98% sure. I write and illustrate scripts and comics: some funny, some horrific, but all heavily seasoned with science fiction and dream imagery. My goal is to be a working screenwriter in Hollywood; meanwhile, writing, illustrating, and publishing stories on my own makes me more attractive to managers and agents who favor go-getters and self-starters. In 2012, just after moving to Los Angeles, I started a webcomic called Miskatonic U, set in the world of H.P. Lovecraft's weird tales. I finished a storyline that took place over one semester at the fictional university, though it took three years to write and illustrate over 350 strips while balancing a 50-hour weekly workload at my day job! I have also entered screenwriting contests and applied to writing fellowships, where I have been a top-ten finalist twice, and made the first cut applying for a TV writing fellowship. In short, I have received plenty of encouragement that I should be writing! Now it's time to focus full time on getting my stories out in the world. I will be writing new scripts for film and television. Some of these I will adapt as graphic novels and submit them for publication to independent comics publishers like Image, Dark Horse, and IDW. 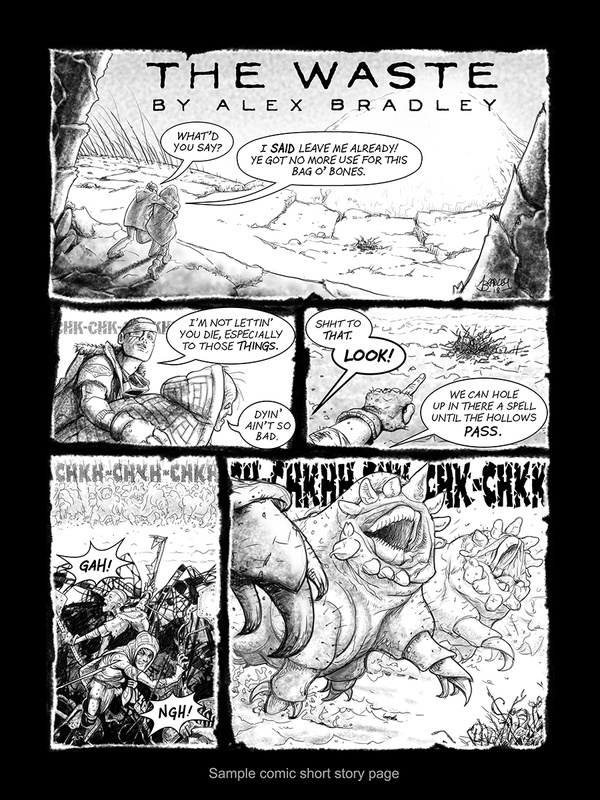 I will also write and illustrate short comics to submit to anthology publications like Flight and IF from Alterna Comics. And because that's a lot of delayed gratification to put up with, I will also continue the Miskatonic U webcomic, which I have too long kept from my wonderfully loyal readers! I have been fortunate to work in design and graphics for over 20 years, and reality television for five. Now I'm committing to getting my own stories out into the world however I can. They say, "Do what you love and the money will come." Riiight. My personal experience has been "Work like a dog and you'll make just enough money to stay right behind the cost of living." Maybe this time will be different. That's where you come in. If you enjoy what I do, and would like to see more of it, please consider supporting me with a monthly pledge. I'll make it up to you with behind the scenes info and personalized artwork, and my bottomless gratitude! Everything helps! At this level, you get links to all my finished works. Thanks for the extra attention! You get links to all my finished works, and access to patron-only activity stream, featuring behind-the-scenes blogs and videos. You like detail? I'll give you detail! You get links to all my finished works and access to patron-only activity stream, featuring behind-the-scenes blogs and videos. By request, I will send you full resolution print-quality files of individual comics or pages. Wow, this support is fantastic! You get links to all my finished works and access to patron-only activity stream, featuring behind-the-scenes blogs and videos. By request, I will send you full resolution print-quality files of individual comics or pages. You will also receive special access to notes, early drafts, pitch documents and unpublished sketches. I am humbled by your generous support! You get links to all my finished works and access to patron-only activity stream, featuring behind-the-scenes blogs and videos. By request, I will send you full resolution print-quality files of individual comics or pages. You will also receive special access to notes, early drafts, pitch documents and unpublished sketches. I will also create an original character sketch to your specifications once a year (not limited to my characters). To be honest, I didn't expect anyone to pick this! You get links to all my finished works and access to patron-only activity stream, featuring behind-the-scenes blogs and videos. By request, I will send you full resolution print-quality files of individual comics or pages. You will also receive special access to notes, early drafts, pitch documents and unpublished sketches. I will also create an original character sketch to your specifications once a year (not limited to my characters). I will also ship you free print copies of any published books.